The M4 is an important corridor in and out of London for those who live and work in Buckinghamshire and Berkshire, as well as those further afield in the South West and Wales, with around 130,000 vehicles using this stretch every day. 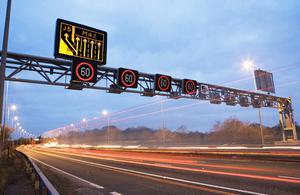 Based on proven benefits elsewhere, we have produced outline proposals that would see 32 miles of the M4 transformed into a ‘smart motorway’; we’re planning extra capacity by converting the hard shoulder into an additional traffic lane and introducing variable mandatory speed limits displayed overhead to help smooth the flow of traffic and reduce congestion, and to provide traffic information, with safety bays in place to maintain safety. We’re inviting members of the public to come along to their nearest public exhibition to find out more about the scheme and give the project team their initial thoughts on the proposals to feed in to the ongoing scheme development. We will host further exhibitions later this year when assessments are complete and our proposals are nearing finalisation. There would be 64 miles of new traffic lane taken from the existing hard shoulder, increasing capacity. The initial scheme design also includes 131 new gantries, with 32 existing gantries remaining. 11 bridges would be rebuilt to provide space for the additional traffic lane and provide safe journeys over the M4 for decades to come. 32 refuge bays are proposed alongside the carriageway for use by drivers in an emergency. Tuesday 18 March between 2pm and 8pm – St Giles Hotel, Hounslow Road, Feltham, TW14 9AD. Wednesday 19 March between 2pm and 8pm – Hillingdon Baptist Church, 25 Hercies Road, Uxbridge UB10 9LS. Friday 21 March between 2pm and 8pm – Theale Village Hall, Englefield Road, Reading, RG7 5AS. Saturday 22 March between 10am and 4pm – Holyport War Memorial Hall, Moneyrow Green, Holyport, Maidenhead, Berkshire, SL6 2NA. Thursday 27 March between 2pm and 8pm – Copthorne Hotel Slough, Cippenham Lane, Slough, Berkshire, SL1 2YE. Friday 28 March between 3pm and 8pm – Winnersh Community Centre, New Road, Wokingham RG41 5DU. Saturday 29 March between 10am and 4pm - St Martin’s Church Hall, Church Road, West Drayton UB7 7PT.